Stephen Colbert and Bill Maher on religion and ISIS: On Late Show deep conversation in the guise of a shallow one. 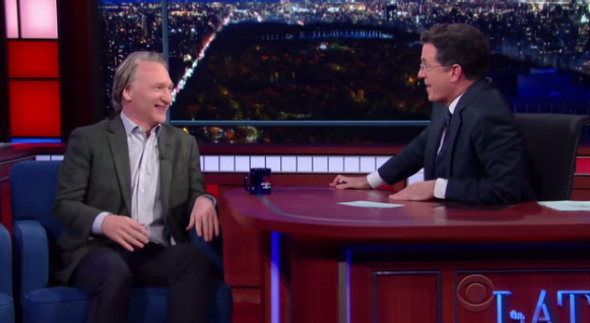 Stephen Colbert and Bill Maher’s chat about religion was surprisingly frank. One of the staples of Stephen Colbert’s new Late Show is the impressive array of conversations he has with non-Hollywood guests like Justice Stephen Breyer, U.N. Secretary-General Ban Ki-moon, and mathematician Eugenia Chang. So when talk-show veteran Bill Maher was on the show Monday night, it was no surprise that the real meat of the conversation came in an enjoyably combative exchange about religion: Colbert is a practicing Catholic (“I give it a shot,” he told Maher, “It doesn’t mean I’m good at it.”) Maher, meanwhile, is a notoriously noxious anti-religious zealot. Come on back, Bill. The door is always open. Golden ticket, right before you, all you have to do is humble yourself before the presence of the Lord, admit there are things greater than you in the universe that you do not understand, and salvation awaits you. Take Pascal’s Wager. If you’re wrong, you’re an idiot, but if I’m right, you’re going to hell. Until the kicker about hell, the audience laughed quietly and uncomfortably, with just a smattering of applause. Maher’s comeback about how he refused to “make up silly stories” earned him whoops of predictably louder approval. He conceded that there were things about the universe he doesn’t understand, but retorted that his response was not to “believe intellectually embarrassing myths from the Bronze Age—but you believe whatever you want to!” They went on from there. While both men maintained their professionally jovial facades, you got the feeling they both really, really meant what they were saying. In my view, Maher came off as typically snide, while Colbert—arguably America’s most likable Christian public figure—was winsome. But no matter whose side you favored, it was undeniably great TV. Colbert has only been at the Late Show desk for a few months now, but he’s already reminding viewers of what talk shows at their best can offer: a deep conversation in the guise of a shallow one.